Some nights, when your baby is teething and overtired and your dinner was boring, you just need to make a spectacular dessert like this one to make up for a really crazy day and eat it while watching the season premiere of Psych (do you watch? So funny!) It sounds really fancy but it was surprisingly easy to make. This would be the perfect dessert to serve at a dinner party when you want to serve something that makes you seem like a gourmet without slaving over perfectly folded egg whites or correctly tempered chocolate. Try it! You'll love it! Combine orange zest, orange juice, lemon juice, sugar and water in a large pot. Peel pears, leaving stems attached, and immerse in pot. Simmer pears over medium heat for 15 minutes until the pears are tender. Remove from heat and let cool in liquid while you make the caramel sauce. Put granulated sugar in a heavy saucepan and crumble the brown sugar on top. Melt the sugars over moderate heat but DO NOT STIR (one thing about melting sugar is never to stir it, which will result in crystallizing). Continue to cook until the granulated sugar is mostly melted (the brown sugar won't melt yet). Stir gently with a fork until you get a deep golden caramel and then immediately turn the heat to medium-low. Carefully pour in the cream and stir in the clove and cinnamon sticks with a wooden spoon. The cream will make the caramel harden and you will freak out for a second but don't worry - it will all work out in the end. (Just like life.) Simmer and continue to stir for about 10 minutes until the caramel is dissolved and the sauce is reduced a bit. Strain the sauce (or at least remove the clove and cinnamon sticks) into a pourable measuring cup. Let cool until slightly thickened. To serve, remove pear from liquid and drain. Transfer to plate or bowl and top with vanilla ice cream. 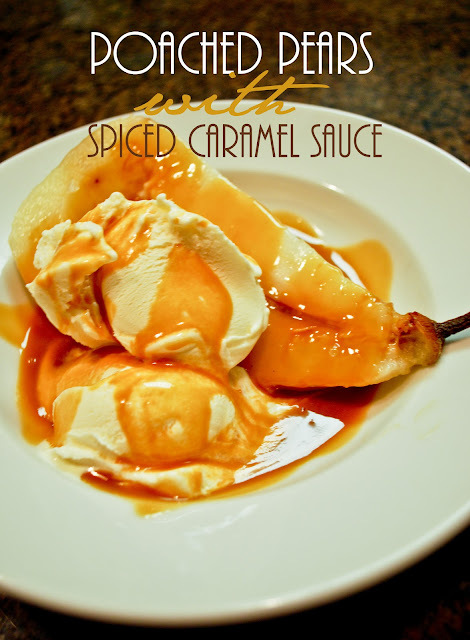 Drizzle caramel sauce on top. Hey, me again :) Keep up the cooking-ness and recipes! Love it! Also, I was wondering, I've been trying to find a place to take a class for upholstery and the only place I've found yet is Glendale Community College which is like an hour away from my house! Question is... did you just learn from your mom, is there a store in the valley that teaches, or do you know of a good book to learn from? Thanks thanks, and your birthday party was so cute! Just the recipe that I needed for a dinner party tonight. I will give all the credit to you! Thank you! I LOVE Psych!! We lived in Point Mugu, CA (45 min south of Santa Barbara) and I totally wanted to stalk the show... Wish I new you too were a fan, I may have tried to conspire with you.